Houston, Texas hosted this year’s Catholic Charities USA Conference, a month after Hurricane Harvey. And in fact, CCUSA changed and rearranged their entire schedule to participate in disaster relief efforts. It was a few weeks before we knew what the conference planning committee decided. But when the email came, it not only said the conference was going to continue, but that the schedule was going to be completely rearranged and changed. Catholic Charities USA, already helping, would give us the opportunity to participate in disaster relief efforts. Never mind the questioning looks when I pumped my fists in the air and cried, “YES!”. Many thoughts ran through my mind, and my heart: I was finally going to engage in disaster clean up, I was going to put my faith into action, I was going to experience a new potential component for our Program, I was going to see first-hand the extreme side of climate-change consequences. I was still going to Texas, and go I did. Sadly, the California-valley-born-and-raised girl in me could not fully appreciate the Texan heat and humidity combo. But my enthusiasm remained undaunted. 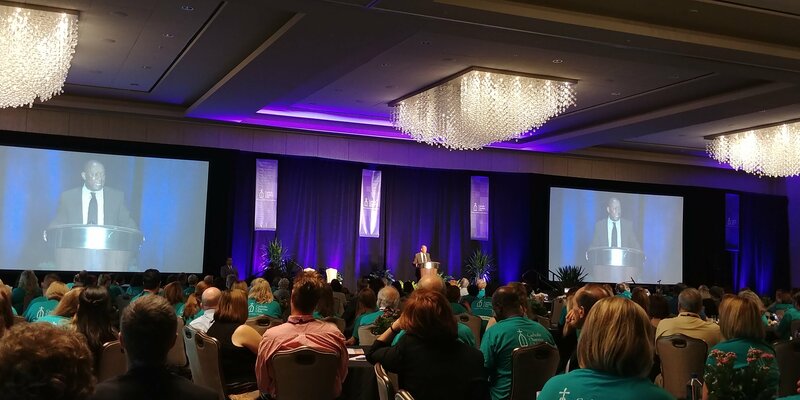 Amidst the orientation, key speakers, workshops–not to mention a cold that decided to attack the day before my flight–I was in awe at Houston’s solidarity, and the eager willingness of the participants. 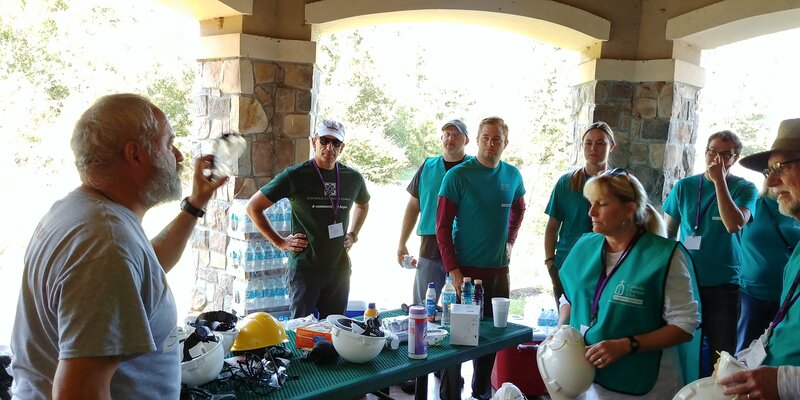 There were three main disaster response activities: assembling and arranging hygiene and cleaning kits, neighborhood canvassing, and house-mucking. A few members of our Stockton agency signed up for the kits. Others including myself signed up to speak to the neighborhoods. We went door to door filling out in-take forms to assess their needs as well as what damages they suffered, and provided gift cards for those in more serious situations. 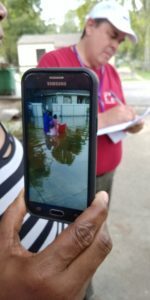 One woma n, who lived with her paraplegic daughter and young granddaughter, showed pictures of her family members carrying her daughter through waist-high floodwater, walking several miles to the nearest help and shelter, her brother’s home. Most spoke of their needs for money to rebuild, let alone food and water. They hadn’t received anything from FEMA, or from insurance. Some also mentioned their concern for their undocumented neighbors, who were too afraid to seek help because of their legal status. Canvassing neighborhoods with contaminated debris stacked outside every single door, is eye-opening as it is. But when I participated in the house-mucking activity, I got an even closer inside look. Houses literally gutted, some even turned over, debris stretching in long bands beside the road, and everywhere the signs of tired dismay. Dolls and toys, refrigerators and pipes, plaster and clothes, littered the streets of these low-income, people’s of color neighborhoods. And the kicker? This particular neighborhood didn’t actually get flooded by the hurricane directly. A dam upriver had overflowed from the hurricane’s downpour, and had to be opened to release the pressure. The neighborhood was given less than 45 minutes to gather everything they could and evacuate. 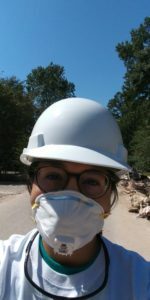 Everything was still considered to be contaminated, so we wore gloves, helmets, eye protection, and N95 breathing masks. 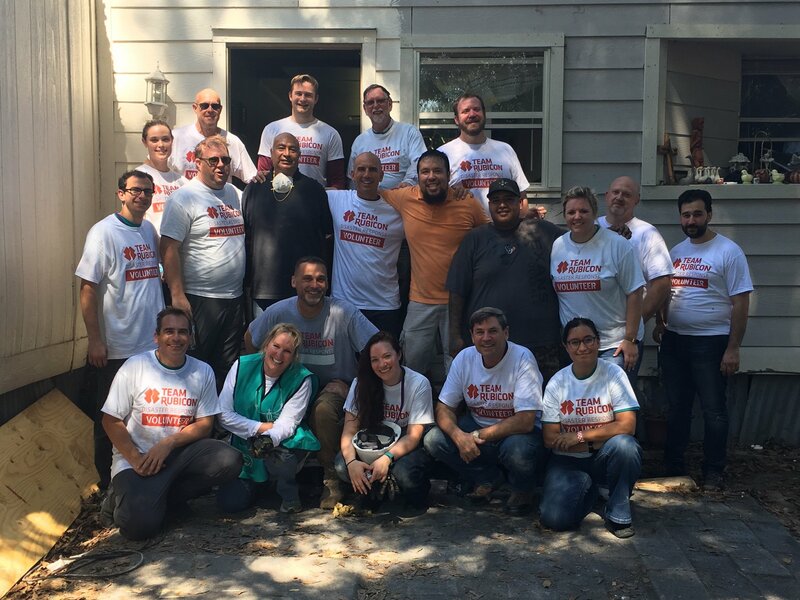 We grabbed shovels and brooms, and went right to work clearing a gutted house. Some carried debris in large chunks, others in filled-wheelbarrows. The damage was clearly shown on some existing walls, at least chest high (using my 5’1″ tall-self as measurement). Our coordinator told us how the residents had been wary of letting people in, because soon after the disaster they were the poster-neighborhood for media, their images being used to ask for money and help. Then the media and news reporters left. Help came. But not to them. As is generally the case, low-income and communities of color tend to be last on the list to receive help. This one in particular, was largely considered to be just outside city limits, so city-funded garbage trucks would come to the lucky house within limits, but not to the one next door and the rest down the street. So people were distrusting and again, many were unwilling to seek help because of legal status. As we finished up our time there, a family came over, and asked to sign up to receive help. Our coordinator enthusiastically took down their information, then told us it was because they saw the continued help that we and other organizations provided, proving dedication, that they were willing to come over. I could only be there one day, but I was so thankful to be part of the rebuilding process. Now, a month later and in the aftermath of the terrible fires in Sonoma and Napa, our Program continues the planning process for localized disaster response. It’s not the type of plan that comes about in a week, and it has a lot of complexities and nuances to consider. But it’s a new step for our Program, and I’m excited to continue this direction, and hopeful that this new aspect will benefit our communities, for if and when disasters from fire to flood, strike our corner of the Central Valley.